Note: This report doesn't cover story from other parts of Arakan/Rakhine state such as Sittwe township where the vast destruction and causalities of death toll exceeds over 10,000 and Kyauktaw, Rambre, Myebon townships. Nevertheless, there is still lack to explore in those regions (Southern Rakhine State-SRS). The lost of lives, properties and destruction in those regions should not be neglected.. 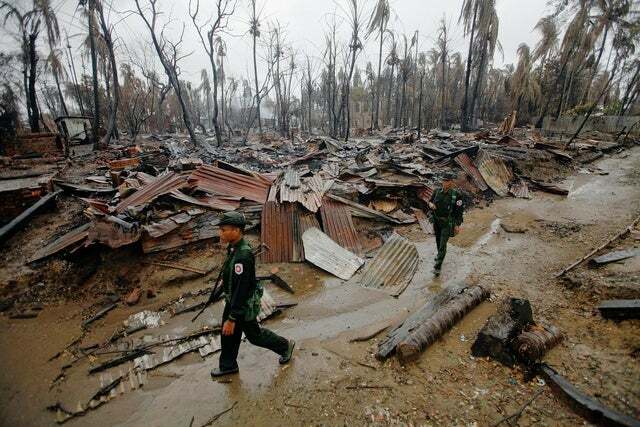 Soldiers patrol through a neighborhood that was burnt during recent violence in Sittwe on June 14, 2012. The Burmese government needs to put an immediate end to the abusive sweeps by the security forces against Rohingya communities. Anyone being held should be promptly charged or released, and their relatives given access. (New York) – Burmese security forces have responded to sectarian violence in northern Arakan State with mass arrests and unlawful force against the Rohingya Muslim population, Human Rights Watch said today. Local police, the military, and a border security force known as Nasaka have committed numerous abuses in predominantly Muslim townships while combating the violence between the Rohingya and ethnic Arakan, who are predominantly Buddhist, that broke out in early June 2012. Human Rights Watch urged the Burmese government to end arbitrary and incommunicado detention, and redeploy and hold accountable security forces implicated in serious abuses. Burmese authorities should ensure safe access to the area by the United Nations (UN), independent humanitarian organizations, and the media. "The Burmese government needs to put an immediate end to the abusive sweeps by the security forces against Rohingya communities," said Elaine Pearson, deputy Asia director at Human Rights Watch. "Anyone being held should be promptly charged or released, and their relatives given access." Burmese security forces have been implicated in killings and other abuses since the sectarian violence in northern Arakan State began, Human Rights Watch said. For instance, on June 23, in a village near the town of Maungdaw, security forces pursued and opened fire on two dozen Rohingya villagers who had been hiding from the violence in fields and forest areas. The total killed or wounded is unknown, but one survivor told Human Rights Watch that out of a group of eight young men who were fleeing, only two managed to escape unharmed after the security forces fired on them. "Everybody was so scared," he told Human Rights Watch. "We saw them entering and we left, trying to get out of the village. There was a canal, but some people could not cross it and the army shot at them and killed them." The recent sectarian violence began after an ethnic Arakan woman was allegedly raped and killed by three Muslim men on Ramri island in southern Arakan State in late May, which was followed by the June 3 killing of 10 Muslims by an Arakan mob in Toungop. On June 8, thousands of Rohingya rioted in the town of Maungdaw, destroying Arakan property and causing an unknown number of deaths. Groups of Rohingya subsequently committed killings and other violence elsewhere in the state, burning down Arakan homes and villages. Arakan groups, in some cases with the collusion of local authorities and police, committed violence against Rohingya communities, including killings and beatings, and burning down Muslim homes and villages. On June 10, President Thein Sein declared a state of emergency in northern Arakan State, which permits the armed forces to carry out arrests and detain people without fundamental due process protections. While the Burmese army has largely contained the sectarian violence, abuses by security forces against Rohingya communities appear to be on the upsurge in recent weeks, Human Rights Watch said. 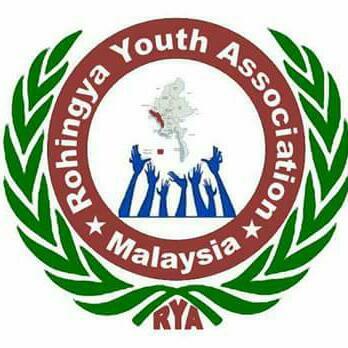 Local police and the Nasaka, claiming to be searching for Rohingya criminal suspects involved in the sectarian strife, have conducted mass round-ups of Rohingya. On July 1, the state-run New Light of Myanmar reported that 30 Arakan suspects were arrested for the June 3 killings. Nevertheless, the mass arrests ongoing in northern Arakan State seem to be discriminatory, as the authorities in these townships do not appear to be investigating or apprehending Arakan suspected of criminal offenses, Human Rights Watch said. The total number of people arrested, their names, and any charges against them have not been reported. Witnesses told Human Rights Watch that state security forces violently raided predominately Rohingya villages in Maungdaw township, firing on villagers and looting homes and businesses. In several villages, police and Nasaka dragged Rohingya from their homes and violently beat them. Witnesses in villages outside of Maungdaw said dozens of people, including women and children, were taken away in mid-June in Nasaka trucks to unknown locations, and have not been heard from since. Mass arrests of Rohingya have also taken place in Buthidaung and Rathedaung townships. Witnesses in Maungdaw township described several instances in which Arakan men wielding sticks and swords accompanied the security forces in raids on Rohingya villages. A 27-year-old Rohingya man told Human Rights Watch, "Twenty-five of my relatives have been arrested.… I saw with my own eyes, two of my nephews were taken by the military and Nasaka. They tried to hide themselves in the large embankments in the paddy fields, but some Arakan found them and stabbed them with long knives. They stabbed them and took them to the jail." Human Rights Watch documented the destruction of Buddhist temples, mosques, and thousands of Arakan and Rohingya houses that were burned to the ground during the sectarian violence, leaving an estimated 90,000 people displaced and taking segregated refuge in temporary camps and community sites. Hundreds of Rohingya fled across the nearby border to Bangladesh, where many were forced back by Bangladeshi border guards. "The violence in Arakan State has devastated both the Rohingya and Arakan communities, but government efforts to identify and arrest those responsible should not result in further abuses," Pearson said. "The sectarian violence and state of emergency provides no excuse for the security forces to continue their past record of abuses and discrimination against the Rohingya community." The Burmese government restricts international access to northern Arakan State – an area comprising the predominantly Muslim townships of Maungdaw, Buthidaung, and Rathedaung – and severely curtails freedom of movement for Rohingya residents. The Nasaka's long history of arbitrary detentions, torture, and other ill-treatment of Rohingya detainees heightens concerns about the recent mass arrests, Human Rights Watch said. The government has not allowed independent investigations in the affected areas since the violence began. On June 6, Thein Sein ordered a high-level government committee to investigate the causes of the violence, identify the perpetrators, and issue recommendations. The committee is scheduled to present its findings by August 30. However, there are concerns about the independence and objectivity of the investigation committee, given that it includes local security forces and Arakan State officials, Human Rights Watch said. The government should invite the UN special rapporteur on human rights in Burma, Tomas Quintana, to Arakan State to conduct an urgent visit to investigate the violence and conduct of the security forces, Human Rights Watch said. The authorities should immediately disclose the location of all detention centers, provide the names of all detainees, bring them promptly before a judge, and allow independent humanitarian agencies access to all facilities. Human Rights Watch urged the United States, European Union, ASEAN, Australia, Japan, and other countries concerned about human rights in Burma to press the government to allow an independent and thorough investigation of the violence, and to ensure that the basic rights of those detained are respected. They should also call upon the Bangladesh authorities not to return or push back those fleeing violence and to provide them temporary protection. "The Burmese government should demonstrate that the political changes taking place in the country extend to the ethnic areas, and that abuses by local authorities will not be tolerated," Pearson said. "This means stopping the violations, holding abusive officials to account, and promptly permitting an independent investigation."